What are the best Vocal Reverb Pedals for singers in 2019? 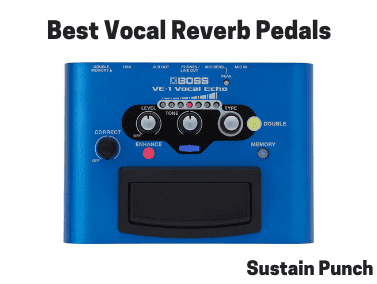 Verdict – The best live Vocal Reverb pedal is? Well, that entirely depends on if you want a device with its singular function to produce vocal reverb, or if you’re after a device that offers the vocal reverb effect alongside a multitude of other functions. If you want a pedal solely for producing vocal reverb then keep reading. If you want a pedal which can produce reverb, alongside other effects such as Delay, Autotune/Pitch Correction, Doubler etc, then take a look at our other article for vocal effects pedals. So, lets firstly describe what a vocal reverberation pedal does, so you know if you really want one, as opposed to another similar unit, such as a vocal delay pedal. Vocal reverb pedals are effect processors which can thicken a vocal take. The effect is used both in live performances and studio recordings. Vocal reverb essentially takes the original vocal signal and delays it by a certain degree of milliseconds, however, this reverb delay cannot surpass a certain degree of milliseconds with it being audible and distinguishable to the human hear that it is a delay as opposed to a reverberation. Therefore, vocal reverb pedals only ‘delay’ the original vocal signal to the point to where the effect still sounds like a reverberation rather than a delay. With that being said, the reverb effect helps to create a thicker vocal sound and makes a natural (dry) vocal performance seem much more refined and better sounding to the audience. Well, lets get to it… We’ve featured the top 4 vocal reverb pedals below. And we’ve gone into further detail to which vocal reverb pedal may be more suited to certain uses. Without further ado, here you go! Memory function allows 3 different configurations to be saved and USB port for home recording integration and downloadable updates. There are other devices at a higher price-point which sound better, but this is certainly a fantastic option for most singers, even if you’re playing huge shows. 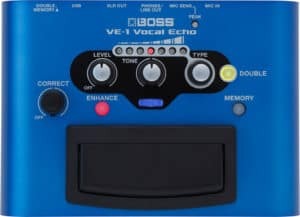 The Boss VE-1 Vocal Echo is a compact, user-friendly effects unit, primarily used to add reverb to a live vocal track. The device comes with over 7 vocal reverb presets which can be further modified, therefore you can experiment and get that perfect sound that suits you voice and style of music, without having to rely on the venue sound engineer. The reverb pedal has all of the controls featured on the front of the device, so you can instantly make changes and there is a large foot-switch to activate and deactivate the pedal effects. It allows for singers to be able to save a maximum of three vocal presets, and offers phantom power so that any active microphones (I.E Rode NT2-A) are able to be used. This pedal also comes with a range of added features, including Doubling, Pitch Correction/Autotune and real-time automated Equalisation and Compression, which means that the device listens to the input vocal signal and determines if it should be boosted or limited in certain areas… so that the performance sounds refined and professional. Honesty, this pedal cannot really be faulted! For a real look, please refer to the demonstration video below. Unlike the Boss VE-2 Vocal Echo unit, the TC Helicon R1 has one singular function, to add varying degrees of reverb. The TC Helicon Singles R1 is an ideal pedal if you’re just looking for a simple to use, plug-n-play vocal reverb pedal. It has 8 reverb effects to choose from (which can all be heard in the demonstration video below) and provides phantom power for those microphones that require it. This vocal reverb unit does not have any memory banks, which means that you may have issues if you have songs in your setlist that require different reverb presets. The pedal also requires mains power to function, which is also a limitation. However, this pedal is still good, it’s just not a patch on the Boss VE-1 for sound or functionality. Ability to use combination of effects, i.e Echo, Reverb and Pitch Correction at once. Now, this is an interesting 9v powered pedal, similarly to the Boss VE-1, the TC Helicon Mic Mechanic 2 offers users a lot of functionality for its price. With Reverb, Echo (tape + digital), Pitch Correction and Auto Tone Compression, De-essing, EQ and Gating this pedal certainly provides all the functionality that a singer will need to create a studio-sounding live performance. Only slight downside is that you cannot save presets, which is important if you have a set that requires different presets to be used for different songs. If this is the case, I would advise the Boss VE-1. However, this is a great pedal if you’re not looking to save presets. After-all, the sound is the most important aspect, right! The VoiceTone Harmony-G XT is more than just a Vocal Reverb pedal, it’s an entire vocal solution for singers. It includes a range of effect options, vocal doubling effects, reverb, pitch correction (auto-tune), vocal tone control (EQ) and A/B switching between saved vocal effects. Certainly a heavier pedal than other options, at 1.3kg, but it’s wide range functions certainly makes this extra weight perfectly acceptable. In summary, here is the list of each pedal, with the star rating. In our opinion, it’s clear that some of the vocal reverb units have more functionality that others, but remember, each of you singers will have different requirements. For me, I like to be able to save presets (Boss VE-1), but you may like the sound of one pedal over another in the demonstration videos.